Systolic and diastolic dysfunction often coexist, although the systolic component usually predominates ( Fig 1). This relates to impaired ventricular contractility and a defective ability of the myofibrils to shorten against a load with a consequent decrease in ejection fraction. 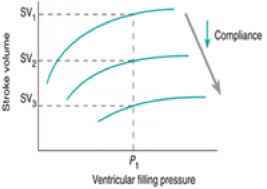 The ventricle lies on a flatter left ventricular function curve (Fig. 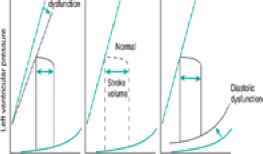 ...2); consequently, the ability to increase stroke volume by an increase in preload is consequently impaired. The ventricle is particularly sensitive to increases in afterload. Fig. 2 Effect of progressive reductions in ventricular compliance on ventricular function curves. If blood pressure remains constant, a similar end-diastolic pressure will generate progressively lower stroke volumes as compliance decreases. Diastolic dysfunction occurs despite a relatively normal ejection fraction and ventricular size. The fundamental process underlying this syndrome is a progressive decrease in ventricular compliance, resulting in marked increases in filling pressures at relatively normal end-diastolic volumes ( Fig ! )■ This abnormal pressure-volume relationship is related to changes in active relaxation during the initial phases of diastole and/or passive compliance during the slow-filling phase. Depending on the ventricle affected, rises in pressure will produce systemic and/or pulmonary venous congestion and interstitial edema. Compared with systolic dysfunction, there appears to be a lower sensitivity to increases in afterload and compensatory neuroendocrine activation is probably less marked. 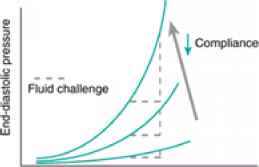 With decreases in compliance there is a progressively limited ability to respond positively to a fluid challenge ( Fig 3). Fig. 3 Ventricular end-diastolic pressure-volume relationship. As compliance decreases, an increase in end-diastolic volume by a fluid challenge will generate a much higher increase in end-diastolic pressure. This can lead to venous congestion and edema. Diastolic dysfunction is more common in the elderly (up to 40 per cent); etiologies range from recurrent ischemia to hypertrophic cardiomyopathy, hypertension, and aortic stenosis. The response to standard failure therapy is generally worse in patients with predominant diastolic dysfunction. 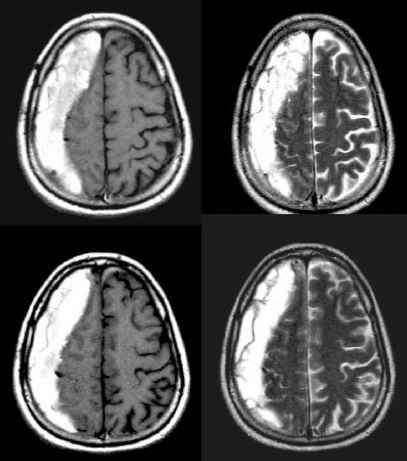 One or both ventricles may be primarily affected by the underlying disease process. While symptoms and signs of systolic dysfunction are similar for both left and right ventricles, diastolic dysfunction affecting the left heart produces pulmonary edema and, for the right heart, hepatic congestion and dependent peripheral edema. A diseased ventricle will often impact upon the functioning ventricle (e.g. septal shift, increased pulmonary vascular resistance).